Rob Kiser|Call Photo Edison State pitcher Dylan Welch throws a strike against Sinclair Sunday. The Edison State baseball team scored just two runs in four losses to Sinclair over the weekend in Ohio Community College Athletic Conference action. Edsion is now 9-15 overall and 4-8 in OCCAC action. The Chargers lost 9-0 and 3-0 on Saturday. In the first game, Edward Alexander was 2-for-3. David Ernst, Wyatt Meyer and Richard Nixon combined on a 12-hitter, striking out two and walking three. Edison lost the second game 3-0. Chase Schoeff and Dylan Arnold both had hits for Edison State. James Ganion pitched a five-hitter, walking six. On Sunday, the Chargers lost 9-2 and 13-0 in five innings. In the first game, Mason Mochabee and Travis Smith were both 2-for-4, while Hommy Lopez had a double. Layne Riley and Kolby Wooten combined on a 12-hitter, striking out 11 and walking nine. In the second game, Dylan Welch and Reese Rogers combined on a 13-hitter, striking out one walking seven. The Edison State softball team split a doubleheader with Lakeland Saturday. The Chargers are now 8-10 overall and 2-2 in OCCAC play. ESCC lost the first game 8-1 and won the second game 10-5. Wendy Hawk had a triple and one RBI, while Kacie Tackett doubled. Hallie Snyder and Tori Smith handled the pitching duties. Snyder struck out four. In the second game, Hawk hit a three-run homer and had four RBIs. Maddie White was 4-for-4, while Hannah Oaks was 3-for-3 with a double. Tackett was 3-for-4 with a double and two RBIs, while Alexis Romine was 3-for-4 with one RBI. Tori Smith was 2-for-2 with a double, Mackenzie Smith was 2-for-3 with a double and Rayna Brownlee had one RBI. Maddy Collier pitched a 13-hitter, striking out one and walking one. 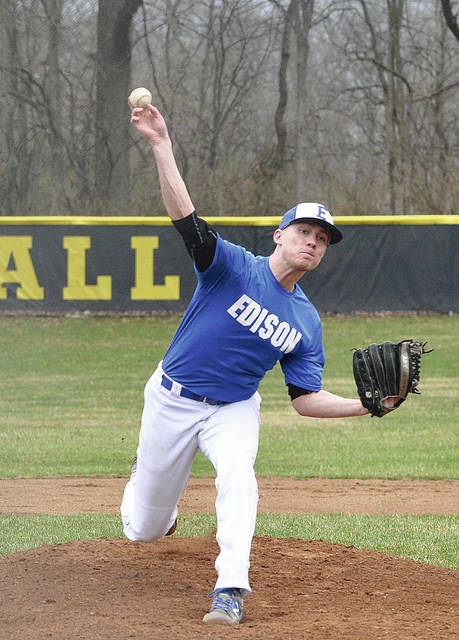 https://www.dailycall.com/wp-content/uploads/sites/30/2019/04/web1_dylan-welch.jpgRob Kiser|Call Photo Edison State pitcher Dylan Welch throws a strike against Sinclair Sunday.